Legal Disclaimer: NOTE: Actual product packaging may sometimes differ from image shown due to packaging updates & improvements by the manufacturer. We DO NOT price match. Tracking information/number provided upon request. We are a drop shipping company and items may come directly from the manufacturer's. We do not ship to PO BOXES. Enjoy The Benefits Of Vitamin D3 And Vitamin K2 with Dr Mercola Vitamins D & K2. There is a combination of nutrients that is highly recommended to support your overall health - Vitamin D and Vitamin K2. Vitamin D and Vitamin K2 work together synergistically - each nutrient aiding the other in its functions. Taken together, the nutrients can effectively support your overall heart health, your vascular system, and your respiratory and immune systems. They also help you maintain strong bones, among other benefits. 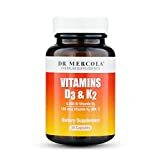 Dr Mercola Vitamins D & K2 supplement: Supplies 5,000 IU of vitamin D3 - the optimal level providing an effective daily dose Provides 180 mcg of vitamin K2 as the MK-7 (MenaQ7) form - the optimal level of K2 in the only patented, clinically supported form on the market today to promote healthy, flexible arteries and overall heart health, as well as bone health Utilizes vitamin K2 produced from chickpeas - proven to be one of the most bioavailable, stable, and beneficial varieties Is soy-free to avoid potential allergen concerns Uses only non-bioengineered ingredients Employs vegetarian-friendly capsules Is free from magnesium stearate - an ingredient added to many supplements that doesn't provide any health benefits but may be detrimental to your immune system. Plus, with Dr Mercola Vitamins D & K2 formula, you only have to take one serving a day, as opposed to multiple times a day with many other formulas that use vitamin K2 as the MK-4 form. With Dr Mercola Vitamins D & K2 formula, you get optimal absorption in an easy-to-take, once-a-day capsule serving.